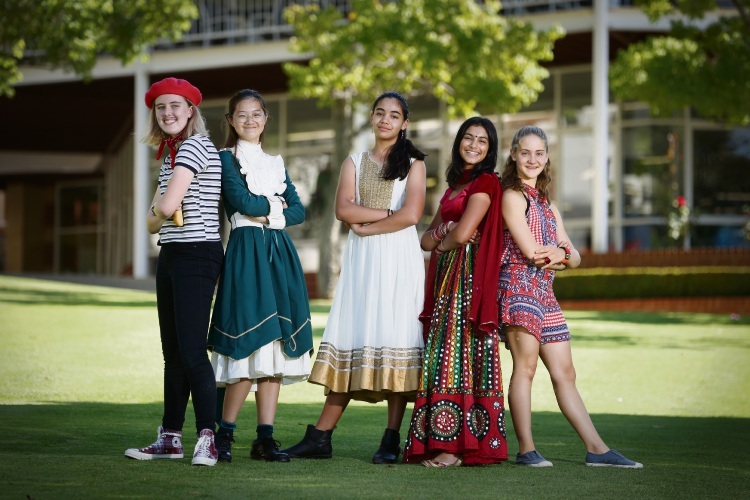 METHODIST Ladies College students embraced internationalism for Harmony Day on Thursday. Year 12 student Chana Van Wyk said students throughout the school dressed up to represent the culture they connected with on Harmony Day. “We had a parade at the Great Court, an assembly, and we have also had different cuisines and food on sale all week,” she said. MLC was one of the first schools in WA to be awarded accreditation to the Council of International Schools (CIS) in 2018. The accreditation was awarded following a review of the school’s intercultural awareness, global citizenship and language learning program. The college is also one of only four schools in WA to offer WACE level courses in four languages including Japanese, German, French and Chinese. Miss Wyk, who is currently studying WACE French, immigrated to Australia 10 years ago from Pretoria in South Africa. She said MLC was inclusive of different cultures and she enjoyed studying a sophisticated language like French at school. “Studying a language at school is ideal because you get to go intensely and in depth into the subject, whereas studying it on the side at home is difficult,” she said.